There are many colorful birds that add beauty to our days and to our lives. The Nicobar Pigeon is not likely one you will see in your own backyard, unless you happen to live in a tropical rainforest. The Nicobar Pigeon is indigenous to the Nicobar Islands, an island chain in the Indian Ocean, as well as Cambodia, India, Indonesia, Malaysia, Myanmar, Palau, Papua New Guinea, Philippines, Solomon Islands, Thailand, and Vietnam where sadly, they are hunted by numerous predators. In an attempt to save the near threatened Nicobar Pigeon from extinction, many zoos have become the home for this exotic beauty where it can be viewed living in ignorant bliss. As you can see in the photos, their gray heads and body serve as the perfect background for a host of spectacular color. My little friend above hides a lovely rainbow beneath his wing. I felt rather honored that he waved to me at just the right moment for me to catch that shot to share with the world. His white tail is an indication that he is an adult Nicobar Pigeon since they are not born with a white tail. Studies indicate that the Nicobar Pigeon is the closest living relative to the extinct Dodo bird, which current DNA studies link to the Pigeon family. All of these Nicobar Pigeon photos are the exclusive property of Sylvestermouse and should not be copied without permission. However, they are available through Zazzle if you would like to purchase one. 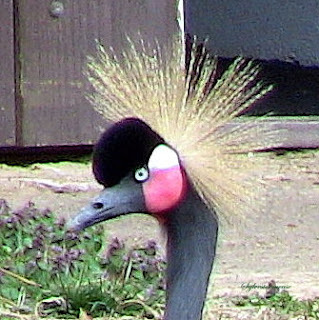 I was lucky enough to spend some time among exotic birds in my local zoo. 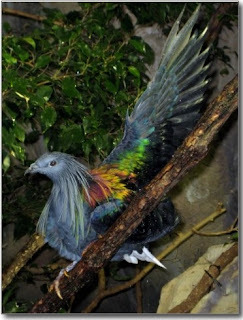 The Nicobar Pigeon was one of them. These beautiful birds are a treat to see, and how lucky you were that this one posed for the picture! Now I know they have a link to the Dodo too.